What's the Best Paid Advertising Budget for Your Business? A paid advertising strategy can drastically affect the growth of your business. And, a well-managed campaign with clearly defined goals and expectations can help your business move in a positive direction. Here's our step-by-step breakdown of how to determine your business's paid advertising budget. 1. Figure out what outcome you're looking for. Defining what kind of outcome is most valuable to you will help guide the rest of your paid advertising campaign. It's important to keep in mind what, exactly, you want your audience to do after they view your ad and click through to your landing page. During this step, you'll also want to ask yourself the following questions: How many leads are you expecting? And, how much exposure are you looking for? Note: if you're a RevLocal client, you can talk to your strategist about industry expectations and current trends if you don't know the answers to these questions. 2. Learn from your past mistakes. If you've tried online advertising in the past but experienced lackluster results, take this as a chance to learn from your mistakes. What did your budget look like? How much have you spent on other marketing and advertising efforts in the past? What kinds of results did you see? Paid advertising works best when the campaigns are managed effectively. If you've been burned by paid advertising in the past, campaign management was probably the problem. 3. 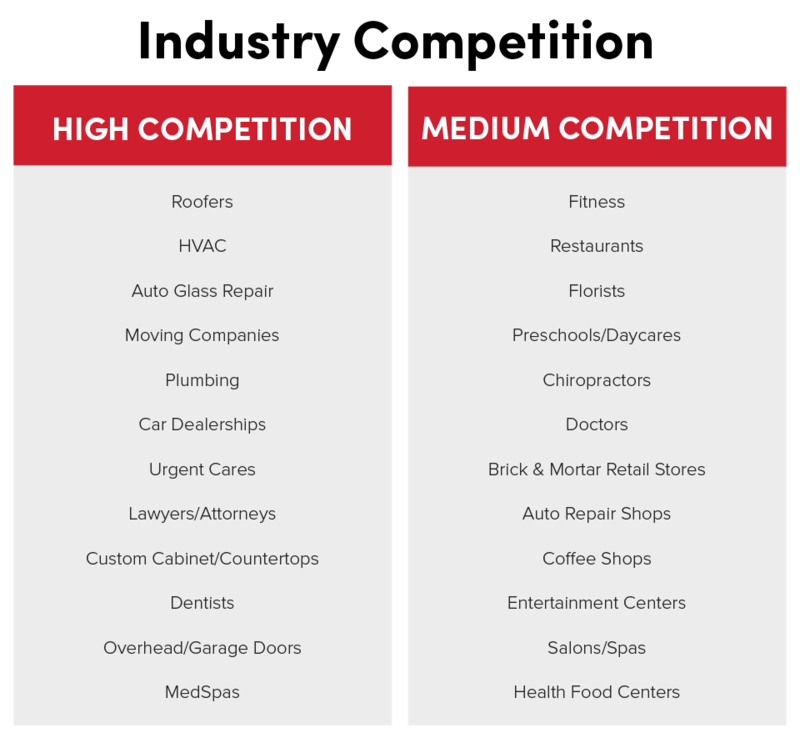 Figure out if you're in a medium-or-high-competition industry. You will also need to determine how competitive paid advertising is for your industry. There are two main types of industry definitions: high and medium competition. There is no low competition; every business can benefit from a well-planned advertising campaign that puts your business in front of the right consumers at the right time. Don’t see your industry listed? Contact your digital marketing strategist to find out more. The person managing your account can offer more insight into your business type in the paid advertising space. 4. Decide if you want to start with a conservative, moderate or aggressive budget. After you identify your business's goals, valuable lead types, and your industry competition, you'll need to answer the following question. What kind of budget should you allocate for your paid advertising? With each industry type, there are three budget tiers you should consider: conservative, moderate and aggressive. Most business owners tend to want to start with a conservative budget, but this isn't always the answer to your budgeting questions. In fact, many businesses will see that, to really experience the best results from paid advertising, you will need to invest a little more. Because of this, they end up needing to increase their budgets after starting out with a conservative ad spend. We see examples of this all the time with clients who are just getting started with online advertising. Here's an example of how larger budgets usually produce better results. One of our HVAC clients was spending $2000 a month on ads, but HVAC is a high competition industry (we'll get to that later) so the ads were only running for nine days. The next month, we made some tweaks so that the ads would run for more days of the month. However, even though the ads were running for longer, the company got fewer leads! The following month, the client decided to change their budget to $5000, which made the ads run for nearly the entire month. They also got more leads and phone calls. That's why we call conservative budgets starting out "test budgets," and we tend to advise against them. As you can see above, the reason for this is that larger budgets (when managed by an advertising expert) will help you expand your business's reach in ways a small budget will never be able to. Your smaller budget would instead run out before you had a chance to maximize your business's reach and make the most of your strategy. To be effective, your ads will need multiple clicks each day and to be eligible to appear in more searches. Test budgets are notorious for missing out on both of these benefits, and this budget is not likely to help you meet your business goals. Our Paid Advertising Manager, Erica Flinn, weighed in on ad budgets for this article. Here's what she had to say. Keep in mind that paid advertising is often pay per click This means every time a relevant person clicks on your ad, then you spend part of your budget. This is why you need a large enough budget to direct traffic to your website as well as a large sample size to get leads from those clicks! What are my business's paid advertising goals? What actions do I want potential customers to take with my ads? Am I in a medium or low competition industry? What is my expected exposure? How many days do I want my budget to last throughout the month? Do I need an aggressive, moderate or conservative budget? Answering these questions will help you design and build a strong campaign within a reasonable budget to help meet your business's goals and help you grow. Check out our paid advertising page for more information on how to grow your business with online ads!